I just finished glue-basting this first block from Aunt Millie’s Garden by Piece O’ Cake Designs. I’m super excited about it, and instead of being exhausted, I can’t wait to start the next one! I’ve been collecting Denyse Schmidt fabrics for about six months in preparation for this project. First I found PimpStitch (don’t miss their blog), thanks to a photo on Flickr. From there, I found Stitchy Stitcherson’s blog (I really love that name), which lead me to AnnieOakLeaves (awesome – free patterns!) which lead me back to Floresita, whose blog I already love (and is chocked full of free patterns), which lead me to Stitchy Britches (another great name), where I ended up at Exceedingly Curious’ scans of an 1886 pattern book! What a cool find! Thanks to John Governale for all that hard work! So that’s it for the black hole of productivity (a.k.a., the internet) for today. I’m stoked about Joe Biden. Excellent choice. I sad the Olympics are over, but glad I may actually get some sleep this week. I’m excited that my husband has a job interview this week and things may be changing soon. Now, it’s 7 am, so it’s time to head to the park before it’s 100 degrees outside! Wow! My morning just disappeared, thanks to this post! I’ve been enjoying your blog for a while and look forward to following the ones you’ve mentioned. Your applique block is so nice. And good luck with your husband’s job interview. This is beautiful! I definitely want to check out that book…I’ve been wanting to do applique like this for ages and this is such a lovely pattern! Kudo’s to you. What a great beginning, great fabric, too! 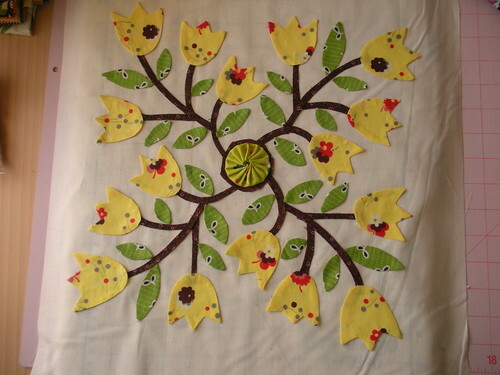 Hi, I am from South Africa and my quilt group have just started Aunt Millies Garden as a block of the month project. I am so excited as my baby is now 16 months old and this will be my first project since he was born. We just got the first 3 blocks (T1-T3)this week. Going to bet started next week when I get my back ground fabric!!! I’m using freezer paper. I cut out my freezer paper shapes (traced from the pattern – keeping the numbers on the freezer paper), then cut my fabric a little bigger, then use starch and a mini iron to fold my fabric around the template. Once all the pieces are finished, I put the pattern under my background, lay out all the pieces on the backing fabric like a paint by numbers. I remove the freezer paper one at a time (because I need the numbers still) and glue each one down with a tiny bit of fabric glue (although, I’ve heard elmer’s works well also). Then I let it dry for a day. Now, it’s all assembled and ready to hand-stitch, and all the pieces are in place. This is the only method I’ve ever used. I don’t know if it’s the best, but it works great for me. Can’t wait to see some pictures of your blocks! would you like to exchange scanned craft books with me?